Oh I love it when Weekend Cooking people try each other's recipes! This one caught my eye too. I love Buffalo chicken. Combining it with roasted potatoes? Brilliant! I have to try this soon. Oh woowww this looks scrumptious. That looks so good -- the perfect winter-time party meal. I missed this when Di posted it and am glad to see it here. This is my idea of comfort food. The Mexican cheeses sound tasty in this dish. 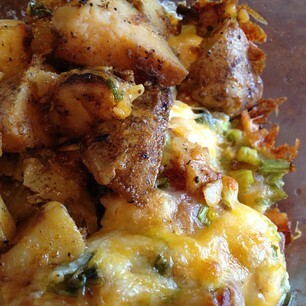 Chicken and potatoes are a winning combination and this recipe sounds delicious. Bring on the heat.... I think I want to make this now. Yum! I may have to make this when the guys come over to watch hockey. I am on the list for that movie with Netflicks...haven't seen it yet. That is some casserole...I could eat seconds on that for sure! Glad that you found and tried my casserole and that you loved it and your changes sound delicious. Thanks too for the linky love back to my blog.